Cleveland, a suburb of Redland City, is situated on Moreton Bay opposite North Stradbroke Island, 26 km south-east of central Brisbane. It was named in 1840 after the Duke of Cleveland. The suburb's northern shoreline faces Raby Bay, which was the name of the castle where the Duke resided. Raby Bay is partly enclosed by the hook-shaped Cleveland Point, where Queensland's first lighthouse was constructed in 1864. A timber structure, it was used until 1974 when a new concrete structure replaced it. The old heritage-listed lighthouse was moved to a nearby reserve. There was considerable shipping around Cleveland Point, some to Brisbane River but much to the Cleveland port. The sand bar across the river made Cleveland an acceptable port, and for a short time it vied with Brisbane as the colony's capital. 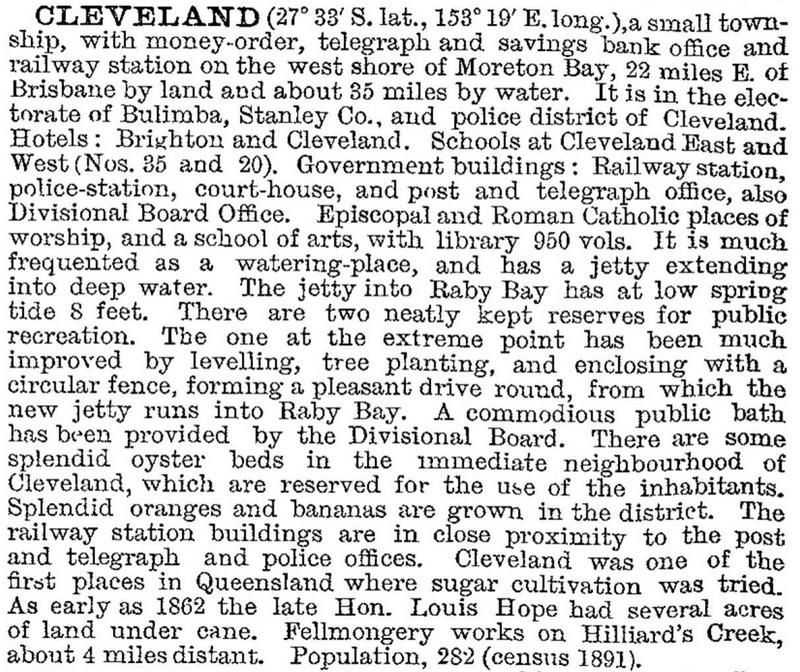 The Cleveland township was proclaimed in 1850. There was a customs house, a long jetty into Raby Bay, a woolstore and a courthouse (1853). The Grandview Hotel in North Street, Cleveland Point began as an inn in 1849; the two storey hotel is listed on the Queensland heritage register. There was a railway line extension (1897) to Paxton Street near the promenade, and there was also a jetty at Paxton Street. In 1948 Cleveland Shire's boundaries were enlarged by the addition of part of Tingalpa Shire, and it was renamed Redland Shire. Shortly afterwards Cleveland's population increased, and a high school was opened in 1962. From about 700 after the war, the town's population was nearly 5000 at the beginning of the 1980s. In the mid-1980s the Raby Bay canal estate was begun, one of the most extensive developments near metropolitan Brisbane. The last canal was completed in 1997. In 1960 the railway service was discontinued, cut back to Lota. Population growth in Cleveland forced the re-opening of the line in 1987. A passenger train crashed into the Cleveland station in 2013, injuring 19 people. The train overshot the end of the tracks and travelled 10 metres inside the station, demolishing a toilet block. Despite the suburbanisation of Cleveland, the Shire Council has maintained a tourism ambience, particularly with its bayside and lighthouse precincts. The Bloomfield Street shopping precinct has been landscaped with numerous examples of public art, and its weekly Bayside Market draws tourists and visitors. There is a ferry service to North Stradbroke Island, near a CSIRO marine research facility. There is also a drive-in shopping centre (1984) with two supermarkets and 65 other shops. In addition to the facilities already mentioned Cleveland has the Redland horticultural research station, a showground, public and private hospitals, retirement villages, the Redland City offices, the Redland Museum (1970) and the Black Swamp wetland. The showground precinct includes the museum, two halls and a war memorial: it was Cleveland's first civic area. The Show Society, however, disbanded in 2002. The whitegoods manufacturer Fisher and Paykel closed their factory at Cleveland in 2009 and moved operations offshore, leaving 300 workers without a job. Fire destroyed the Cleveland ambulance station and four emergency vehicles in 2010.